Can I use my Raspberry Pi to provide the PWM controlling my ESC, but have the ESC powered by a separate battery? The ESC I'm using is "A1S 3A Blheli 1S Super Mini Brushless ESC". It's awesome. And it works when I connect the ESC wires to the Pi's GND and 5v/3.3v supply. A Tiny ESC for a Tiny motor. But it doesn't seem to work when I connect the ESC to a separate battery. I think the battery's GND isn't exactly the same as the Pi's GND, thus the Pi's PWM signal isn't compatible with the battery's power supply. 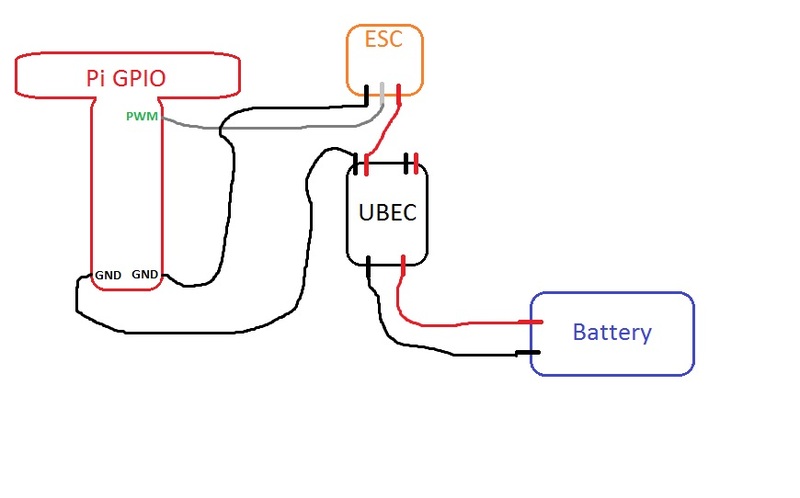 Maybe I can power both the Pi and the ESC from the same battery+UBEC so they share the same GND? Before I try that I'd like to see if I'm doing things wrong. You need to connect the Pi ground to the ESC power supply ground. They need a common voltage reference (ground) for the Pi's signals to be correctly received by the ESC. This is generally true for any device you wish to control via the Pi unless you are using something like an opto-coupler between the Pi and device. Not the answer you're looking for? Browse other questions tagged gpio pwm battery dc-motor or ask your own question.